Marie-Francoise-Thérèse Martin, known as “the Little Flower of Jesus,” was born at Alencon, France, on January 2, 1873. 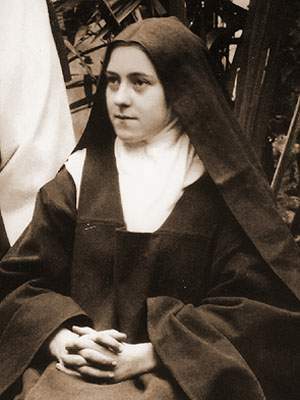 Reared in a home of comfort and surrounded by refinements that would have spoiled an ordinary child, Thérèse’s intelligence had an early dawning which enabled her to comprehend the Divine Goodness far in advance of her tender years. Our Lord visited upon the child a severe trial — a strange malady from which there seemed no recovery. Her implicit confidence in God, however, overcame her infirmity and she progressed rapidly toward sanctity. Thérèse adopted flowers as the symbol of her love for her Divine Savior and offered her practices in virtue, sacrifice, and mortification as flowers at the feet of Jesus. At fifteen she entered the Carmelite Convent at Lisieux, France, where she distinguished herself by punctual observance of the rule, burning love for God, and wonderful trust in Him. Before she died, the “lily of delicious perfume,” as Pope Pius X called her, revealed to the superiors her life story in pages of rarest beauty. She died in the odor of sanctity on September 30, 1897, at the age of 24. Since her death countless graces have been attributed to her intercession. Pope Benedict opened the way in 1921 for the process of her beautification. Pope Pius XI declared her blessed in 1923, and canonized her on May 17, 1925. Reflection: “For one pain endured with joy, we shall love the Good God more forever” – the Little Flower.